At a White House forum held on Thursday, President Obama said patients own their data, and that they are key to making this new research initiative succeed. The core of this initiative is enlisting a million Americans to contribute their data to research. Pooling genetic sequence data from a million people will in turn help power unprecedented insights into the genetics of disease and could lead to new breakthroughs. 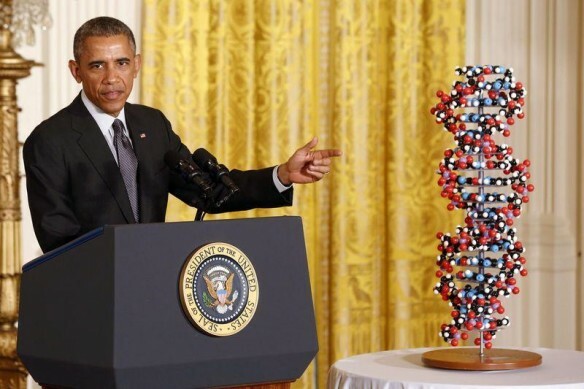 At the forum on the initiative last week the NIH announced that they had taken some of the first steps to build the infrastructure for that work. But building the infrastructure and collecting data simply isn’t enough. People are the key to this kind of consumer-driven research. This is something that 23andMe knows a little about. Last year we became the first direct-to-consumer genetics company to genotype a million customers, and more than 80 percent of our customers consent to participate in research. Doing this right means enlisting a million people in research, who are both engaged in their health, and empowered to understand and use their personal health information. People want access to this information, and for the most part they also want to participate in meaningful research, but they want to be treated as partners not as subjects. 23andMe has already seen the power of this sort of “people powered” research model, and it’s heartening to see officials recognize that for the Precision Medicine Initiative to succeed they must enlist people’s as partners in research.